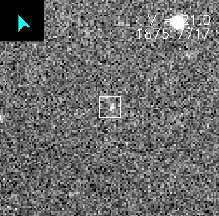 Astronomers with the Spacewatch project at the University of Arizona in Tucson and the Minor Planet Center (MPC) at the Smithsonian Astrophysical Observatory in Massachusetts have discovered the first new moon of Jupiter in more than a quarter of a century. 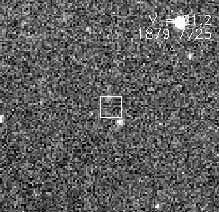 Spacewatch astronomers Jim Scotti, Jeff Larsen, Tom Gehrels, Joe Montani and Spacewatch director Bob McMillan took images of the object, previously designated asteroid 1999 UX18, during their Spacewatch shifts in October and early November 1999. MPC astronomers Gareth Williams and Tim Spahr, and MPC director Brian Marsden this week confirmed by orbital calculations that the object is not an asteroid orbiting the sun, but a previously unknown moon of Jupiter, the first found since 1974. The newly found satellite is perhaps 3 miles across -- the smallest moon ever found for any of the major planets, the discovers said. The moon, designated S/1999 J1, belongs to a subgroup of outer satellites that make complete, eccentric orbits around Jupiter at an average distance of 15 million miles every two years, the MPC astronomers calculate. Further observations are needed to more reliably calculate the moon's orbit, after which MPC would assign the moon a permanent number, McMillan said. Jupiter and its moons will be too close to the sun to be detected by Spacewatch for another few months, although larger telescopes might recover it sooner, McMillan said. Spacewatch uses a 79-year-old, 36-inch telescope on Kitt Peak, Ariz., to survey the solar system for asteroids and comets. 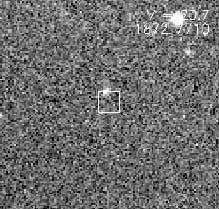 If the discovery is confirmed, S/1999 J 1 will be the 17th moon found at Jupiter and the first unknown moon detected by Spacewatch, McMillan said.